Staff members and children from Liberty Children’s Home (LCH) travelled to San Pedro in the early morning of Sunday, December 11th to take part in a yearly fundraiser held on their behalf. Thanks to the efforts of Peter Lawrence, Ms Diane Campbell and Friends of LCH, the special visit to the island and the fundraiser were made possible. The aim of the fundraiser was to raise $15,000 to assist LCH with their utility expenses among other necessities. In speaking to The San Pedro Sun, Ms. Delfina Mitchell, director at LCH, joined the group and expressed her gratitude to San Pedro. “First of all I have to say I love San Pedro and the people of San Pedro because they have always been supportive of us. They always pour out their love to us. In the past they did a jump-a-thon and a fundraiser which raised, I believe $18,000 dollars and this year they are doing it again”. About their travel to San Pedro, Ms Mitchell commented, “We started out this morning. Peter Lawrence sent a boat all the way to Vista del Mar for us. We got on the boat and they drove us out here. We saw the beautiful blue green sea and the beautiful sun. It was really nice and they did it not just for the children but for the Care-givers; the people that are working with the children. This for me is very special because a lot of the time people tend to forget about the people that are behind the scenes doing the work and these people have been with us three or more years, they know the kids. I am really very grateful to Peter and Diane Campbell who organized this that they also acknowledged the work that my caregivers are doing”. 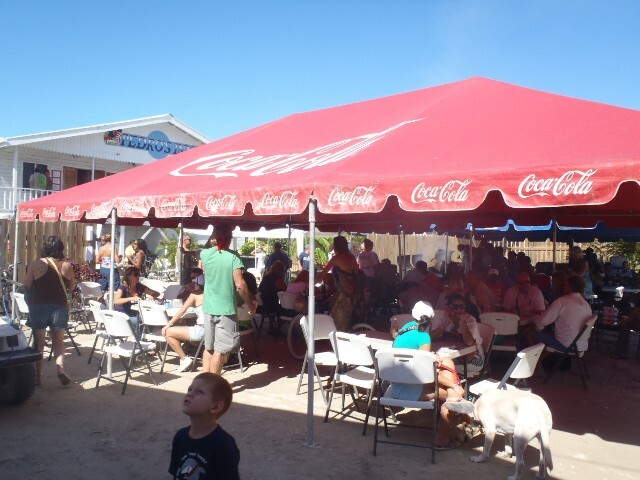 Once in San Pedro the group got to enjoy Walter’s delectable BBQ as well as entertainment by Tull, Coconut Leo, Valentino, Barefoot Skinny and pretty much anyone else that wanted to step up to the mike and perform. The children were in heaven as they frolicked in the swimming pool, along with children from San Pedro. The kids that didn’t want to swim had much to keep them occupied with bubble blowing and hula hoops, as well as the jump rope. The LCH fundraiser started around 11am and went on through the late evening. As the day went on, Jan Brown took to the mike and introduced the concept of the Chinese Auction which got the crowd exited for bidding on wonderful prizes donated by the various establishments on the island. The fundraiser managed to just over $16, 000. While this takes Liberty a long way, it is in no way all that is needed. According to Ms. Mitchel the home is in constant need of financial assistance for the everyday running of the facility. “Liberty is an organization that relies heavily on donations and at this time, it’s really not coming in and so we have to do things to cut down on expenses and we need all the help that we can get. Aside form financial assistance, you can donate goods in-kind. Fish for example, is something that the kids don’t get a lot of so if there is any fisherman that would want to donate fish or sell it to us at a reduced cost we’d love to have it. Donations of rice, chicken, flour, even furniture are greatly appreciated”. Liberty home is licensed to house 40 children and all the children come through the Department of Human Services. At the moment Liberty houses 23 kids between the ages of 2 – 14 that are all up for adoption. Individuals interested in adopting or providing respite care for a child or fostering a child are welcome to do so by contacting the Department of Human Services. Organizers would like to thank: Mambo Chill, Lola’s Pub, Sailsports Belize, SP Animal Hospital, AJ’s, Grand Caribe, Estel’s, Wahoo Lounge, Ambergris Divers, Premium Wines, Roadkill, Costa Maya, CG Esthetics, GO Phones, Crazy Canuks, KAKAW, Randy and Cherie – Guests at Pedro’s, The Greenhouse, Croc’s Bar, Picasso Spirits, Fido’s, DandE’s, Superbuy, Mathieu’s Deli, Glow Belize, Belizean Melody Art Gallery and everyone that contributed to make this fundraiser a huge success. For further information on assisting Liberty Home, please call 225-2158 or 624-3696 or visit their website, http://www.libertychildrenbelize.org. Catch all the action at Pedro’s Bar – with 2 Big Screen TV’s (60 inch and 48 inch) plus a number of other TV’s you won’t miss a minute of the action.